Fasting is going without. This may be in relation to food or some other necessity or luxury. It is a common part of religion. The Christian faith holds prayer and fasting as key factors of a “healthy” relationship with God. Today, fasting and prayer are somewhat ritualistic. In some charismatic circles, fasting is done at the start of each year without fail. Some wonderful ministries that I know of fast for the first 21 days of the year. All this is admirable. I do question, whether the essence of the fasting and prayer trickle down from the leadership to the congregation members and others who just fill the pews. Nothing we do for the Lord, our God should become ritualistic, just one other thing we need to tick off the list. Rituals tend to lose the heart that is meant to be behind what you are doing. What does fasting in the bible look like? The verse above is a great example of how easily believers tend to replace the desires of God with rituals. God desires sacrifice, but not at the expense of mercy. He desires burnt offerings, but not at the expense of knowledge of him. What is your fasting coming as a replacement of? It is common for modern day churches to be dens of thieves, as long as they are generous to the ministry. Is that true fasting? You will recall that; reflection and self-examination are key components of this prayer course. Perhaps the best part to start would be identifying why it is that we fast. 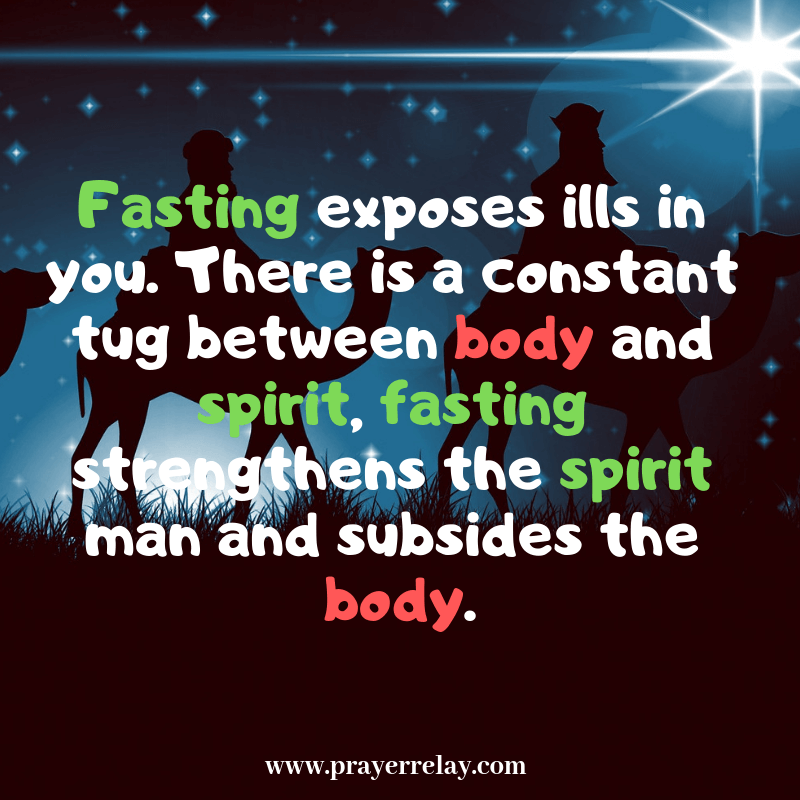 The heart behind fasting is subduing one’s physical needs so that the spirit may be amplified. This is what feeds the power of prayer. Rich or poor, most of us are defined by our means. We are defined by the food that we eat, the places that we go to and the sort of people that we keep around us. The heart of fasting is casting these aside and focusing on the Lord, God. Howbeit this kind goeth not out but by prayer and fasting. The scripture above speaks of things that cannot be overcome by prayer alone, but by prayer coupled with fasting. Even Jesus’ ministry was preceded by time in the wilderness, a time of fasting and prayer. It was preceded by a time where he would be tempted on a weakness that his sacrifice in fasting had created. If you consider that the body is temporary, while the spirit is eternal, you will make sense of why it is important to build longevity in spirit. Fasting builds that longevity in spirit. Fasting lends power to prayer. It is difficult to stay in tune with the Lord as well as to hear his voice above the noises of this world. The essence of fasting is, shutting out the world’s noises that you may hear from the Lord. You will not that fasting was often done in the wilderness. This would have been a way of physically separating oneself from all the day’s hassle. We are to find time to pull away, into that secret place of prayer. 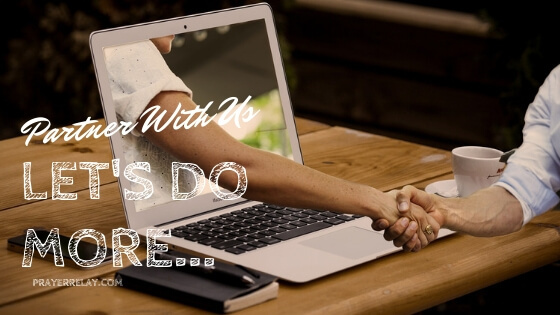 As a carpenter, I imagine, Jesus would have had some clients coming over to place orders, his mother would have needed a hand with something, but be withdrew himself from all of this, so he could be with the FATHER. Are you making time to withdraw yourself from everyday mundane, that you may be with the father? Do you allow time for prayer? I say, allow, but more like “mandate!” Such is the need for prayer. This is more so when you are going through a fast. The Lord is more concerned with the heart behind the actions, than the actions behind the heart. Actions can be faked, or done out of the wrong motive, but the heart tells all. If your heart is not in this fasting, there is no point doing it at all, really. Your time should rather be invested in prayer for the state of your heart. Like most Christian things nowadays, the essence of fasting has been somewhat lost in believers’ goal to make it more mainstream. Although there are many factors behind this, one of the main attributes of this is the financial incentive that comes from filling our pews. If the people we want to bring in do not agree with some of the things that we don’t think are necessarily key to our faith, we start to compromise these things. This is what has in some ways happened to fasting. We are building comforts within our fast, so as to accommodate all. Is this the loss of the essence of fasting? Are the results worth it? We have also become so caught up in names and types of fasting. The driving factor in most of the new variants is our desire to appease God while maintaining our comfort. There is a lack of the desire to sacrifice, which is the heart behind fasting. “Sacrifice is the language of the spirit.”- Pastor Bonnie Deuschle. You and I must not become too focused on ticking this ritualistic box, lest we lose the value and essence of fasting. Outside of sacrifice, there is no true fasting. 6am till 6pm fasting (going without food between those hours). 3 Day fast (going for 72 hours without). 7 Day fast (gong for 162 hours without). Biblical fasts noted Jesus as having fasted for 40 days. Other fasts recorded include queen Esther’s fast for the lives of her people, the fasts of several prophets. The common factor in these is sacrifice. A fast void of the sacrificial factor is not a fast at all. It doesn’t matter how long you do it for, sacrifice is key. Current medical advice is that one should not go without water for over 7 days. It is possible to go without food longer. Again, if we are getting stuck on food, we are missing the point. Isaiah makes it clear what true fasting is. A full fast is one where you go for a certain number of days with no food and drink. A semi dry fast is when you go for a certain number of day without food, but with liquids. It is certainly more physically sustainable than a dry fast for prolonged periods of fasting. This was established when Daniel didn’t want to eat the royal food served in the palace. As a compromise with the caretaker, he would only eat fruit and vegetables, but no meat. Presumably, he would also drink liquids. It is also later recorded where Daniel spent 3 weeks fasting. He avoided luxury. A partial fast is one that does not span an entire day. It may be fasting from sunrise to sunset. This is where a group of people collectively go without food for a common cause or need that they are believing God for. The scripture above explains exactly why some periods of “so called” fasting bear no results. Why are some periods of fasting and humility in seeking God not met with any results? 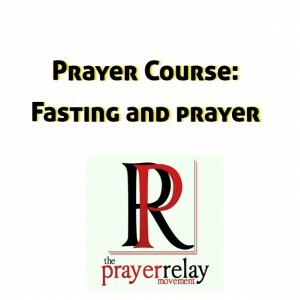 Our relationships with other people are a key component of any fasting. True fasting starts in your own homes, in the workplace and every other place that you spend time. Often, people will fast and pursue God while they are simultaneous ill-treating others. Consider your fasting for a moment. Remember, a key part of this prayer course is self-evaluation and reflection. It is very rare that anyone will tell you a deeper truth that you can tell yourself. At times, you must look in the mirror and show yourself where you are slacking. I believe that this is one of the key reasons why miracles are drying up in the Western world as they grow in the east. We have become so consumed with patriotism that we begin to hate our brothers and sisters from different races, faiths, denominations and so on; yet we still go before God in the name of fasting. How can we say we love God, and hate our brother? Cleaning our heads, hands and hearts is important for true fasting. Fasting is casting our own ways away that we may walk in Christ, we walk like Christ in his fullness. Is your walk mirroring Christ at every turn? Fasting is taking time out to be intentional about our father’s business. Where you see yokes, you are going after them, to break them. Fasting is seeking out the broken that you may extend the hand of the Lord. You are a carrier of grace, are you walking and imparting it as you go? Wherever Jesus went, the presence of the Lord was encountered. That is a sign of fasting, becoming Jesus to the least among us. That food you are not eating today, take it and give it to the needy. Fasting is practical, as described above by the prophet Isaiah. 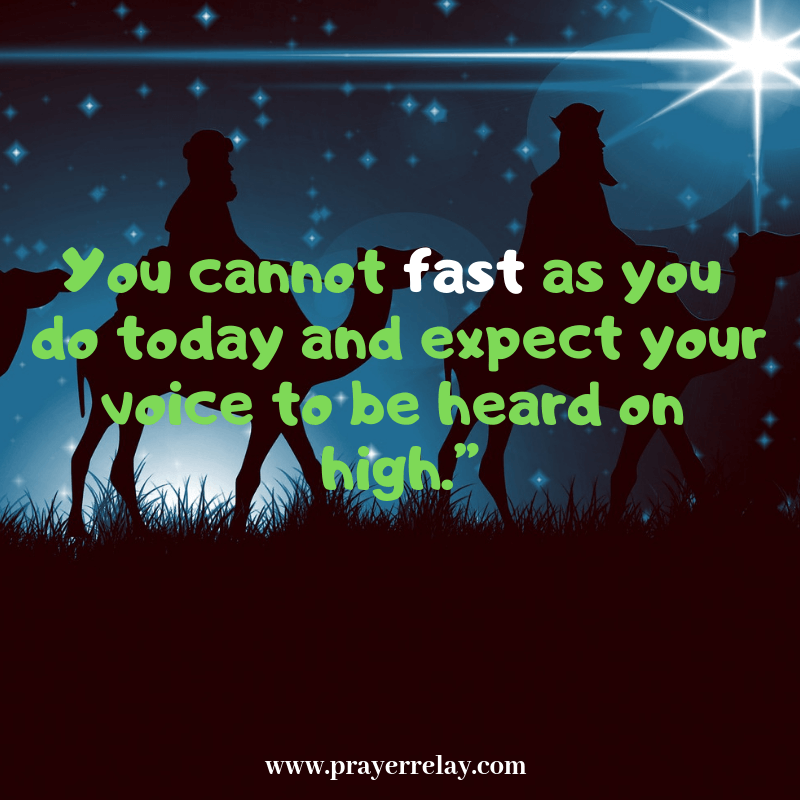 The prophet Isaiah goes on to speak of the results that we are to expect from true fasting. Is it not time you and I began to truly fast? Fasting has often been associated with the wilderness. This is where Jesus went off to be with God in fasting and prayer. This is where the prophet Elijah went, and more and more have done the same. What does the wilderness look like for you and I today? Today the wilderness is stepping out of routine that we may have become comfort and stuck in. The wilderness is shaking off our feet that have become stuck in the mud. We are called to be movers and shakers! Prayer plays a massive role in a fast. When you pray you are not alone, you lean on the Lord. Prayer allows us to allow God to communicate to and through us as we fast. In solitude, as the prophets of old and Christ did, prayer gives the Holy Spirit a channel to use us to intercede in matter that we know not of. Like communication is to a marriage, prayer is indispensable to the Christian walk. It grants us an honest, open and direct platform to speak with God. Fasting is often done with a result in mind. Through prayer, we present this result to God. Only through prayer can our fasting be committed to the maker of heaven and earth. The bible recounts several sacrifices. They were all punctuated by prayer. The showdown on mount camel was punctuated by prayer! God responded with consuming fire! Prayer is key to fasting. No disrespect to anyone, but Daniel’s fast should be viewed within the context in which it was done. Daniel fasted, by his refusal to defile himself. This was a move of obedience. Today, we have picked this as the “fast” of choice because it is easier on the body than a dry fast. We are a people after comfort, while trying to please a God who is after obedience and sacrifice. It worries me that we now have recipes for “Daniel’s fast”, adding pleasure to an act of sacrifice. Before we dive behind “grace”, let us never forget that grace does not take away the need for sacrifice and obedience. Everything you do for the Lord should be viewed in the context of your heart’s condition in doing it, as well as what it costs you. King David would refuse to give God gifts that were of no cost to him. What is the cost of your gift to God? I charge you, step out into true fasting! The cost of your gift. Dont make it about food. Before he was to embarked on his 3 years in ministry, Jesus took time away. He spent this time alone with God, fasting and praying! Jesus fasted! The son of God, who was God himself, fasted. We know that he spent 40 days and 40 nights alone fasting and praying in preparation for what was to come. We understand that at the end of this period, at a point of weakness, when all bodily strength was drained, the devil pounced. Jesus was filled in spirit, though hungry in flesh. He resisted temptation and the devil fled! The back story for this one is more theatrical. King David had lusted after the soldier, Uriah’s wife. He had then gotten taken Uriah’s wife to be his own. She had then become pregnant. The scripture below recounts the encounter between David and the prophet Nathan, who comes to confront him! David repented and fasted in hopes that the Lord would preserve his child with Uriah’s wife. 15After Nathan had gone home, the Lord struck the child that Uriah’s wife had borne to David, and he became ill. 16David pleaded with God for the child. He fasted and spent the nights lying in sackcloth b on the ground. 17The elders of his household stood beside him to get him up from the ground, but he refused, and he would not eat any food with them. 19David noticed that his attendants were whispering among themselves, and he realized the child was dead. “Is the child dead?” he asked. 20Then David got up from the ground. After he had washed, put on lotions and changed his clothes, he went into the house of the Lord and worshiped. Then he went to his own house, and at his request they served him food, and he ate. 22He answered, “While the child was still alive, I fasted and wept. I thought, ‘Who knows? The Lord may be gracious to me and let the child live.’ 23But now that he is dead, why should I go on fasting? Can I bring him back again? I will go to him, but he will not return to me. Samuel fasted at a time of war, asking that the Lord would intervene on behalf of Israel, as they had become hard pressed at war. The fasting was corporately done. All Israel came together at Mizpah to fast and intercede. They fasted and confessed their sins. 5 Then Samuel said, “Assemble all Israel at Mizpah, and I will intercede with the Lord for you.” 6 When they had assembled at Mizpah, they drew water and poured it out before the Lord. On that day they fasted and there they confessed, “We have sinned against the Lord.” Now Samuel was serving as leader[a] of Israel at Mizpah. Elijah was a prophet at a very difficult time. He had his last meal before going to meet with God on mount Horeb. Like, Jesus, Elijah went without food. It was a bold statement to self, saying “God is my rock!” The same God that would soon answer by fire at the showdown with the prophets of Baal. And he arose, and did eat and drink, and went in the strength of that meat forty days and forty nights to Horeb the mount of God. 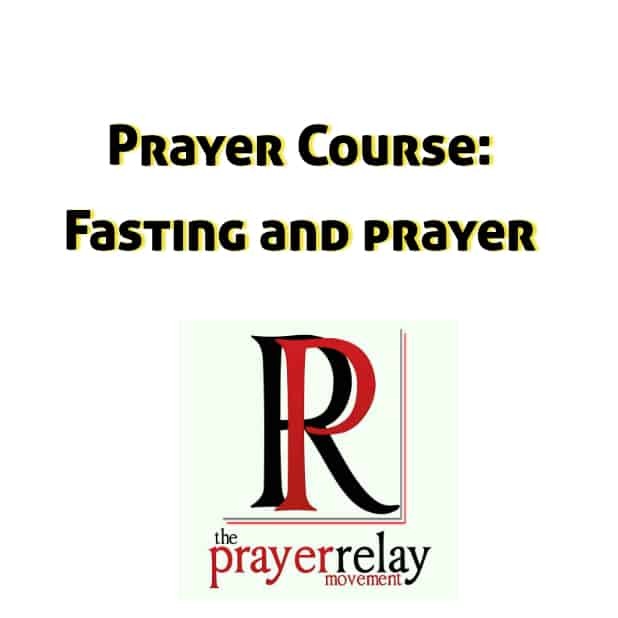 This post is a module that is part of our free prayer course. Father I bless you name for this opportunity to seek your face. Your word says to seek you while you can still be found. Purify my heart, mind and soul in this time of fasting. Meet me at my point of need. Give me strength to endure. Consecrate me for your will in my life. Strip me bare, I desire more of you and less of me. As flesh subsides, magnify my spirit. Magnify your Holy Spirit in me.